To experiment between the cooking sprays, I sprayed both cooking sprays to new pans. Then I brought both the frying pans to the same temperature at the same time. 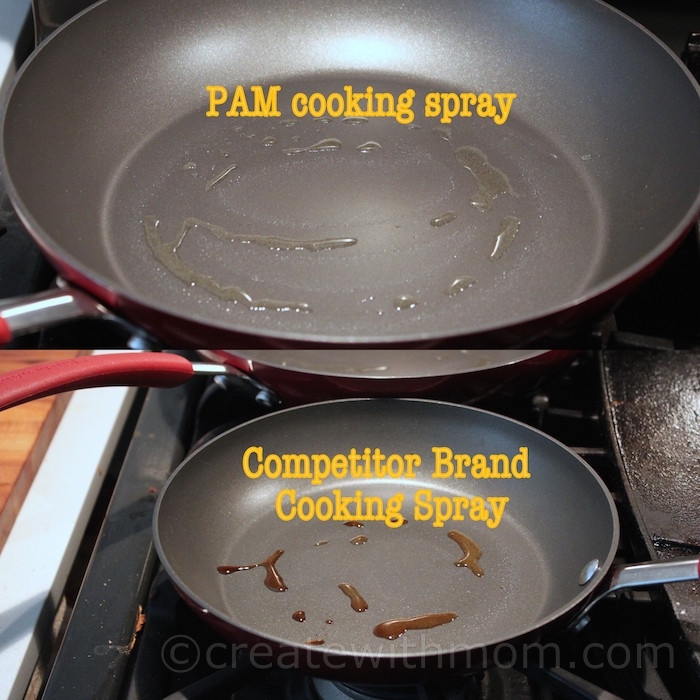 I found the competitor brand cooking spray became darker (like it burnt) quicker compared to PAM. This made me realize that this could be a reason why residue stays when we put certain cooking sprays to baking pans and remove the baked goodies. I sometimes find it hard to clean up the residue when it stays on cookware and bakeware. At these times, I find myself either soaking the dishes in soapy water, or applying elbow grease and pressure to clean it off. This way of removing residue is not always convenient when we want to quickly clean up. PAM® cooking sprays says that it leaves up to 97 percent less residue buildup than other competitor brand cooking sprays while offering superior no-stick results. 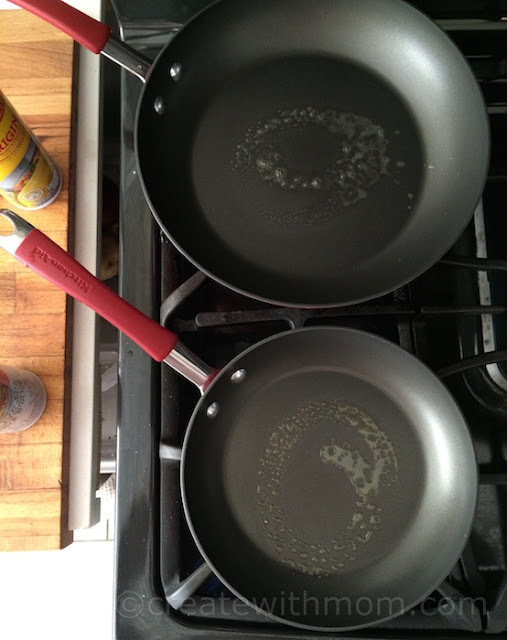 Using PAM will provide a no-stick surface, and it will not retain residue when we remove our cooked meals or baked goods from the cookware or bakeware. We can use this cooking spray for cooking, grilling, and baking. PAM's new 97% less residue formula is available in grocery and mass stores in Canada. Although, during big baking sessions I find using cooking spray to be helpful with prep and clean up I do not like using cooking sprays because they contain unnecessary additives and chemicals. I also do not like the empty cooking spray containers using up energy when they end up in the garbage/recycling after a few uses. 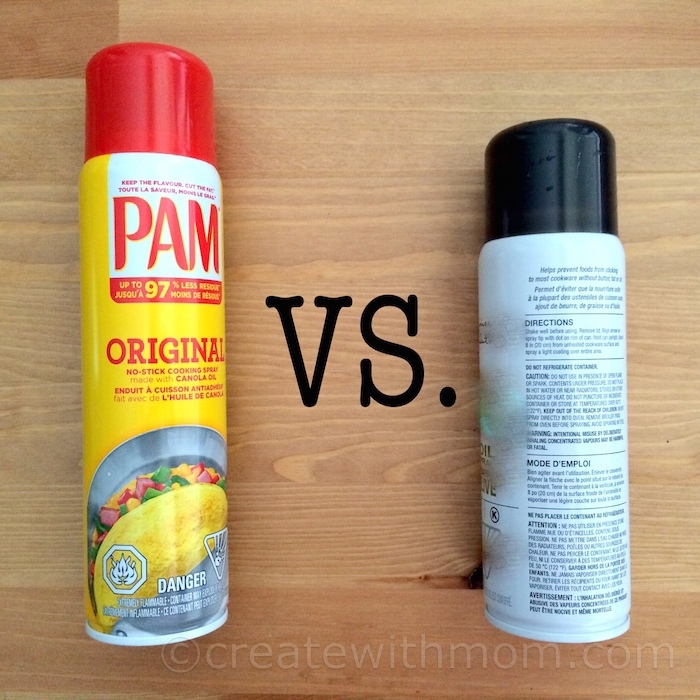 I use Pam occasionally by I too prefer a basic Olive Oil or something with less additives! I used to use Pam, but have changed to a misting oil device. I have not used any cooking spray for years as I don't consider them necessary. I agree with you about the environmental concerns about cooking sprays but there are times when they are extremely useful so I do use them occasionally. Bailey Dexter I only use Pam, tried others but always come back to it! I have always used only Pam!! I've only used PAM once (at my parent's place) and I was pleased with it. I think it's a popular brand for oil sprays but if I ever feel like I need it, that is the one I will buy. Other than that, I stick to my Oil Sprayer. Too many chemicals in cooking sprays for me to feel comfortable using them. I prefer regular oil over cooking spray. I only use cooking spray for my wafflemaker or breakfast sandwich maker and I use the walmart brand and have never noticed a bad residue. I used to use PAM, but haven't. Probably try using it again. I thought they were all the same. I guess I am wrong.